The PC industry may be shaken up by the rapid encroachment of tablets into consumer and enterprise spending habits — a trend that’s seeing lighter devices like the iPad, as well as cheaper tablets like Amazon’s Kindle Fire and more, eat into the market share of bigger and more expensive computers. But it’s all a matter of perspective: today IDC said that it’s actually lowering forecasts for tablet shipments this year and in the future. “Growing competition”, IDC says, from smartphones with bigger screens (the recently-legitimized phablet) and wearables like smart watches, combined with a lack of exciting tablet product launches in Q2, are leading the analysts to says that there will be 227.4 million tablets shipped worldwide in 2013, down some 2 million from 229.3 million as previously estimated. Yes, it’s not a huge drop, and you can argue that these are only estimates anyway. And it’s still some 57.7% higher than 2012 shipments. But IDC’s figures point to some themes that are worth watching for: whether even less-expensive tablets are possibly still too expensive for what consumers are willing to pay; whether even tablets — in some regards pared-down in functionality from PCs — are still too over specced for what many consumers want and need; and the issue of how much of our wallet we will want to dedicate to these products, as more of them enter the market. On the enterprise side, IDC notes that right now, in fact, the tablet is pretty minor but is growing: It notes that tablet adoption in sectors like education and retail collectively accounted for 10% of all tablet sales in 2012, and that will only grow to 20% by 2017. 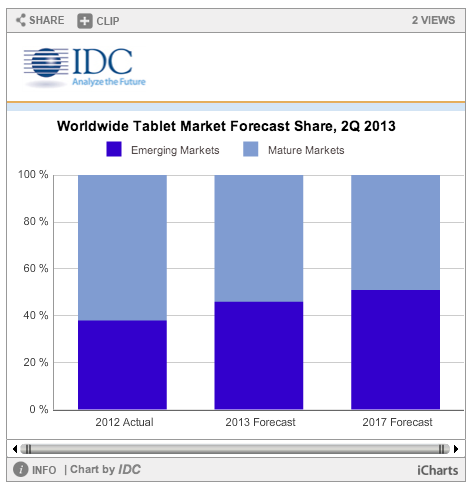 IDC also notes that it’s starting to see more developed markets already take their feet off the gas in terms of rapid adoption, with “maturing markets such as the U.S. now expected to cede share more rapidly to emerging markets such as Asia/Pacific.” It predicts that by 2017 there will be 407 million tablets shipped. More immediately, competitive pressures will mean lower prices for tablets coming soon, IDC notes. “We expect average selling prices to continue to compress as more mainstream vendors utilize low-cost components to better compete with the whitebox tablet vendors that continue to enjoy widespread traction in the market despite typically offering lower-quality products and poorer customer experiences,” writes Tom Mainelli, research director for tablets.